Brian and Francis officially ended their run in last month’s The Flash #24 with the end of their Reverse-Flash arc, so the two of them coming together for this one-shot was quite a high. 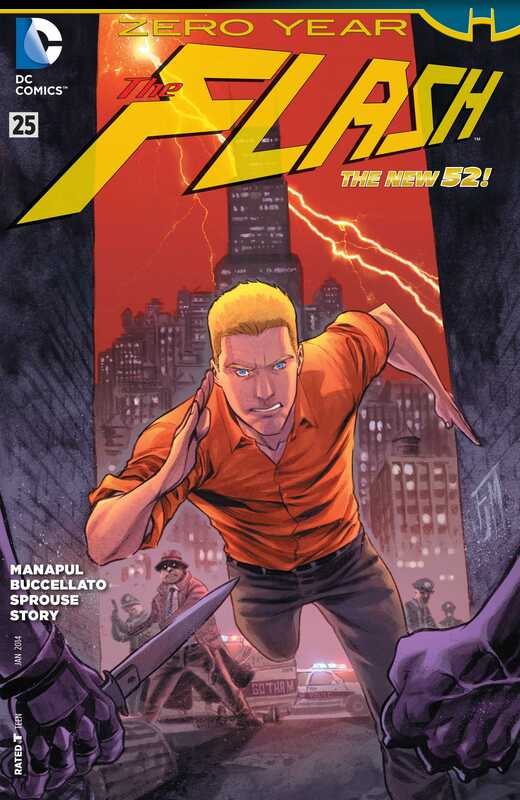 With Zero Year, they focus on a power-less Barry Allen who has just recently graduated from the Central City Police Academy and has been sent to Gotham to help out the understaffed GCPD. It provides a really interesting set up for the character, putting completely outside of his usual element and showing him as a fresh-faced and inexperienced cop who is still heady with the notions of lawful justice and doing things by the book. Over the entire issue, the two writers give Barry a taste of Gotham and show how his view of police-work changes due to his experiences in Gotham. The writers have been incredibly consistent with their characterisation of Barry in the last few issues and they bring that same consistency to this story as well. The Scarlet Speedster isn’t so quick on the uptake in these early days and he is prone to taking risks due to his idealism. Most of the Zero Year tie-in issues I’ve read so far have struggled to find their own voice with this crossover. Not so with The Flash #25 because the writers give a very strong reason for Barry being in the city and they tell a story that is focused on himand they show how he changes. In the other titles, it is more of the same, the characters are as they are in their regular comics and so there isn’t much of a characterisation shift that shows how the characters grow. Not so with Barry. The Barry at the end is a different Barry than we see him in the beginning. He’s learned the lessons of Gotham and he has more of a respect for the city and its ways. Harvey Bullock, one of my favourite supporting characters from the cast of the Bat-verse, is the Gotham cop that Barry is paired up with and he serves as an excellent tutor for Barry. He’s a rough cop who understands his city and he finds Barry’s idealism almost insulting, something he’s quick to point out again and again. Its like one of those “veteran cop, rookie cop” stories and it works really well. The primary art duties are divided between Chris Sprouse, who handles most of the internal pencils, and Francis, who handles the last few pages. The art shift is somewhat jarring, but that is to be expected since the two artists have very different styles, although they complement each other. Francis has built up his style and his definitive traits over the entire run of the relaunched title, so I expect his art to be of a high standard, which it is. With Chris, there were inconsistencies with his character builds and character faces, which seemed to vary from page to page, but that’s really about all the criticism I have of the issue. Karl Story, Keith Champagne and Francis handle the inks for the issue while Brian does the colours and there is an overall unification to the art which helps make this one of the best drawn issues of the month. There is no over-the-top darkness to their Gotham like you can find in Detective Comics or Batman right now, so that helps to make the issue stand-out. And that’s a good thing. Overall, this was a good place for Brian and Francis to end their combined run at. Its a good outing for the character and I’m certainly going to miss the two of them on writing duties. With the two of them no longer on the title, the next three issues are all one-shots, so it’ll be fun to get that wider perspective on the Flash-verse, particularly since Brian is writing two of those issues. Good read and definitely among the best I’ve read this month! More The Flash: Annual #2, #23.1, #23.3. Posted on November 28, 2013, in Comics Reviews, Review Central and tagged Barry Allen, Batman, Brian Buccellato, Carlos M. Mangual, Chris Sprouse, Comics, Comics Review, Flash, Francis Manapul, Gotham, Harvey Bullock, Iris West, Karl Story, Keith Champagne, Review, Review Central, Scarlet Speedster, Superheroes, The Flash, Zero Year. Bookmark the permalink. 7 Comments.